We exported this well drilling Solids control System to indian,our customer use it for offshore oil & gas well drilling. There are five-phase purification equipments as shale shaker, vacuum degasser, desander, desilter and centrifuge for the purification and circulation of the drilling liquid. This system is designed to guarantee the smooth performance of separation, circulation, injection and confection of the drilling liquid and to fit the space available and weight requirements of the subject drilling unit The whole system is explosion proof, anti-corrosion and leakage proof. The electric apparatus is DIIBT4 explosion proof, while the motor is out-of-door explosion proof motor. The tank body made of V-shape corrugated sheet has high integral rigidity and artistic configuration. With GN team. We provide fully trained Operators with many years of experience in Closed Loop Operations. 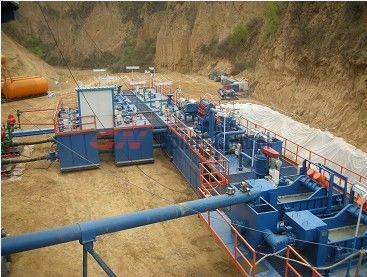 Why GN well drilling Solids control system? China manufacturer GN Solids Control offer the world with well drilling Solids control system.We are an exporter of well drilling Solids control system for Indian, Russian,middle east.etc.Oilfield Company of the United States and Century Int’l Oilfield Equipments LLC of the United Arab Emirates etc.choose us as supplier.Our factory and company are Quality Management System ISO 9001-2000 certified.GN solids control operate international oil gas drilling mud separation system sales,service,manufacturing,distribution serivce.Buy well drilling Solids control system from China manufacturer.Your best well drilling Solids control system trade starts here.